Classically beautiful wedding at Army Navy Country Club in Arlington Virginia. This portrait was captured in the grand staircase beneath the crystal chandelier. When considering a location for your vows, views of Washington D.C. are a must have for many brides. Army Navy Country Club has sweeping views of the National Mall, The Washington Monument, and the surrounding golf course from their expansive balcony. The balcony has two large porches to give your guests a reprieve from the elements, along with a large open area overlooking the lush and well manicured golf course that leads to the D.C. skyline. The balcony is perfect for a spring or fall ceremony or a late summer cocktail hour. The ballroom on the third floor is reminiscent of the early 20th century era with opulent mirrors and large open windows that offer a unique view of the country club's grounds. Sunset light warms the room and gives it a welcoming glow as your guests mingle and enjoy a plated dinner in the expansive space. 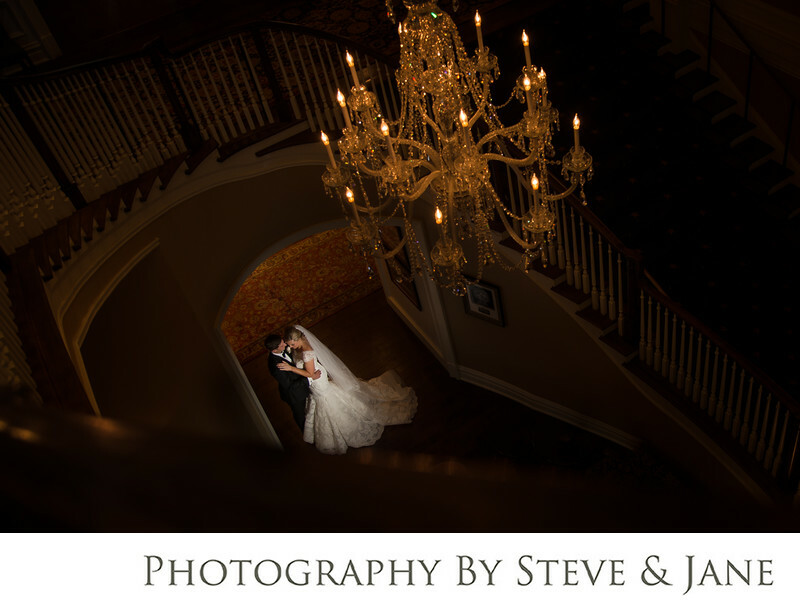 The grand staircase in the lobby just outside the ballroom is a great location for some portraits as a married couple. Designed to impress, they stretch three stories and surround a massive crystal chandelier. Location: 1700 Army Navy Dr, Arlington, VA 22202.